In his sixth solo exhibition at Sies + Höke, Federico Herrero (*1978, Costa Rica) shows new paintings and painting-installations. 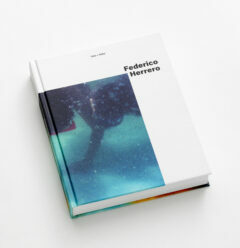 Federico Herrero is considered one of the most important contemporary artists in Central America today. Some monochrome and some multi-coloured, his space-embracing abstract paintings feature an intense and luminous chromaticity. Informed by urban landscapes, the energy of a developing country’s incomplete and constantly changing structures, and Herrero’s own enthusiasm for the nature of his home country, his paintings also bear reference to the work of artists such as Roberto Matta or Hélio Oiticica, as well as to the tradition of colour-field painting. It is important to Herrero that his painting is not viewed in an elite and isolated context, but that it becomes part of society and of everyday-life. As support for his paintings Herrero not only uses canvases of sometimes extreme dimensions, but also “volumes” made of concrete, walls and the public space: high-rise façades in São Paulo, bridge piers in Colombia, fishermen’s huts in Basel or the Venice Biennale’s crumbling wall, for the design of which he received the “special prize for young artists” in 2001, at only 21 years of age – Herrero coats building surfaces with the same abstract colour formations that are also found on his canvases. Here and there one can see the influence of urban environments with their road signage, coloured façade designs and graffiti. These markings and colour zones establish a basic visual communication that Herrero seeks to extend to his painting. The dominance of blue and green in his work adds a reference to his native country’s rich tropical flora, which incessantly seems to overgrow and claim back citified area. His projects in the public space, which are often located in socially disadvantaged neighbourhoods and which he creates with the assistance of local communities, also testify to Herrero’s almost utopian belief in the positive effect of colour and the possibility of improving individual living conditions through painting. Thus, his work features a component of critical reflection on modern life between built and natural habitat. In this exhibition, Herrero presents an intensively coloured, immersive room installation, a group of new canvases of different formats, and a window installation made of coloured acrylic films. Parallel to the exhibition, a comprehensive monographic catalogue will be published, showing Herrero’s work of the past 15 years on over 300 pages, alongside four commissioned texts by Chris Sharp, Lisette Lagnado, Sofía Hernández Chong Cuy and Sandino Scheidegger. Federico Herrero lives and works in Costa Rica. His work is part of the most important museum collections worldwide, including the Solomon R. Guggenheim Museum, New York; Philadelphia Museum of Art, Philadelphia; CCA Wattis Institute for Contemporary Arts, San Francisco; MAM Museu de Arte Moderna, São Paulo; Hara Museum of Contemporary Art, Tokyo; 21st Century Art Museum, Kanazawa (Japan); MUDAM, Luxembourg and Tate Collection, London. Solo exhibitions took place at Galeria Luisa Strina, São Paulo (2015); La casa encendida, Madrid (2014); 21st Century Art Museum, Kanazawa, Japan (2012); Contemporary Art Gallery, Vancouver (2011); Casa de America, Madrid (2011); Kunstverein Freiburg, (2008) and CCA Wattis Institute for Contemporary Arts, San Francisco (2008).